Tap on "I'm new to Genius Cloud"
Choose between a monthly and a yearly subscription. The App Store will ask for a confirmation and handle the process. Genius Scan will automatically start synchronizing your documents and unlock all Genius Scan+ premium features. 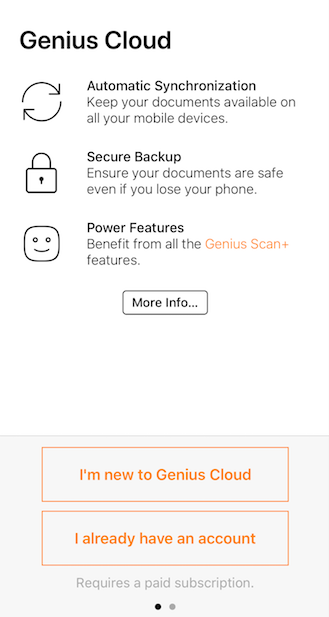 You can connect all your mobile devices to Genius Cloud (iOS and Android) and get all your scans synced and backed up. If you want to download your documents on a computer, log into your account on the Genius Cloud website.